Cut-off Circulation: If a toe or leg is involved (ie. toe chewing), the possibility of a hair or thin thread having wrapped around the limb should be considered. Thin human hair gets easily wound around limb. They can be invisible to the human eye and cause discomfort and even pain to birds, as they cut off circulation. The hair or thread / string needs to be removed immediately as it will otherwise cause the limb to potentially die off or be chewed off. Household cleaning items, laundry products, perfumes, scented products and other chemicals in your home. Personal Care Items: Shampoos, body / handcreams, sunscreens containing zinc, hair sprays, and other personal care item. Close contact with you will expose your pet to the chemicals / toxins that you yourself used on your body or on your clothes (i.e. perfume, dryer sheets). 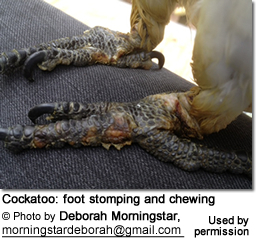 One web visitor reported that her parrot stopped chewing his feet after she switched to an unscented, natural hand and body lotion. Birds can be sensitive to anything their feet come in contact with - including chemicals that you put on your skin or hair. Potential food allergies (i.e., wheat, corn) should also be discussed with your vet.Something that could easily be overlooked would be simple discomfort of a sticky foot after eating. If your bird likes to eat holding food (juicy fruits / veggies) in his foot, this foot is likely to get sticky, which may bother your pet. Washing your pet's foot afterwards would resolve that issue. Spraying water on your pet's foot after a meal is probably the easiest way to achieve that. The investigative process should include the obvious places your parrot likes to hang out, and consider any potential / harmful chemicals that he or she could have been exposed to on those places. People have reported success in stopping a bird from mutilating themselves by using a "tube collar". NOTE: This is only a temporary fix and the root of the problem needs to be investigated. The following website gives instruction. I personally prefer, and have successfully used, a "tube" cut from a sock (simply cut the "foot" off a thick sports sock". I cut a couple of slits for the wings. Please refer to the photo of my pet bird Xena - a PDD victim. The Avianweb strives to maintain accurate and up-to-date information; however, mistakes do happen. If you would like to correct or update any of the information, please contact us! THANK YOU!